The purpose of this article is to serve as a general strategy guide with tips and advice that you should follow when attempting to win a stacked burger challenge. Burger challenges are by far the most popular type of food challenge that restaurants choose to host, and there are over 2,000 burger challenges available around the world. 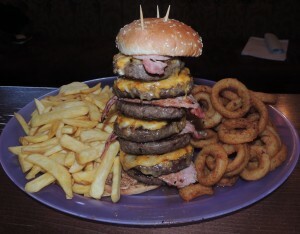 Many of those challenges involve a burger with just 1 very large beef patty, but a majority of burger challenges involve a burger that contains multiple beef patties stacked up on top of each other. Some may have just 2 large patties, and you may encounter a burger with 12 smaller patties. I have even seen burgers with over 20 patties stacked so high that skewers were required to keep the towering beast from falling over. Even though there are many different variations that you may encounter, the basic strategy that you need to have remains similar for every variation. Before we go into the specific strategy details for winning a multi patty burger challenge, please make sure you have read and understand our Basic Strategy For Winning A Food Challenge article. That article is full of 14 different basic strategy tips that will not be included in this article, which you also need to understand before attempting a stacked burger challenge. Please start off by watching our very informative How To Win A Stacked Burger Challenge video so that you can visually see all of our different tips put into practice during an actual multi patty burger challenge. For this video, I attempted The Triple Linny Burger Challenge at Uncle Linny’s Family Restaurant in Pontoon Beach, Illinois. There is a burger consisting of three different 1lb beef patties that are topped with cheese & vegetables. This challenge included a side order of fries and a 45 minute time limit. Winners get the meal free and a hat. 1. Do not start until the burger has cooled down – Most challenges are served to your table extremely hot as soon as everything is cooked and assembled because the restaurant knows that everything will eventually get cold by the time you finish. If you begin your challenge too early while the food is still too hot to eat, you will burn your tongue and mouth which will cause you pain throughout the entire challenge. Once the timer starts, it starts, and there is no starting over. You will have to use liquids to help cool the food off in your mouth, and take up valuable space in your stomach, or you will have to change up your strategy until the food is cooled off so that you can eat it. If you bite into the burger and you realize it is still way too hot, you will have to eat fries and side items until you can eat the meat and toppings. To save yourself a lot of pain and confusion, make sure that your food is cooled down enough before you start eating. Lift up the top burger patty and see if there is still a lot of steam. If it is still too hot, wait a little bit longer before beginning. Eating is not much fun if you are in pain!! 2. Eat all of the burger patties except for one – Since you want to eat the meats and toppings first while they are hot and juicy, focus on eating the burger patties first along with the toppings. Because you will have to eat the bun eventually too, continue eating the burger patties layer by layer until there is just one left for you to eat. 3. Break it down layer by layer to help with both warmth and flavor – To help avoid flavor fatigue and keep the burger delicious the entire time, and to help keep the burger meat warm for as long as possible, only eat the burger one layer at a time. Typically there is cheese and other toppings placed between each layer, and each burger patty insulates the patty and toppings below it, keeping everything warm. This is why the top patties may be completely cooled down while the bottom patties are extremely hot. It is a very bad strategy to break down the entire burger so that you can eat the toppings first before the meat, or the other way around. If you get down to just a single burger patty that is cold and dry with no toppings on it, and you don’t like the flavor, you will have to use beverages and/or sauces to help force the meat down, which will take up room in your stomach. You won’t have to worry about that problem nearly as much if you just break down the stacked burger layer by layer. 4. Use the water-filled veggies to help swallow your food – Tomatoes, pickles, onions, and most other vegetables are filled with water, and they are included with most burger challenges. It is recommended during quantity food challenges that you should minimize the amount of liquids you drink while eating so that you don’t fill your stomach up to the point where you cannot fit all of the food in it. To help minimize the use of unnecessary liquids, eat some vegetables along with your bites of burger, and use the water in those veggies to help you swallow the food. You have to eat those vegetables anyway, so use them to help you get the big victory. This also works for “runny” side items such as coleslaw and baked beans if they are included with your challenge. Use the liquid in those sides to help you swallow your food without having to use beverages that are not required. You should dip your buns in them too or simply eat a few bites of bread, followed immediately by a spoonful of your runny side item. This will be much more efficient than just eating everything separately. 5. Eat the last patty with the bun just like a normal burger – You are attempting a burger challenge, so at this point you should actually enjoy a real hamburger or cheeseburger. Once you have finished all the burger patties except for the last one, put that last one along with any remaining toppings in between the two buns and eat it like a normal burger. With most stacked burger challenges, the meat is the focus of the burger, and the buns are usually pretty thin. Therefore, it is okay to eat the last patty with the buns, rather than eating the buns separately. It is really up to you and your preference at this point. Eating the last patty with the buns vs eating all of the meat & toppings first and then eating the buns separately, both methods will yield similar results. If there are multiple buns involved, which typically occurs when a restaurant takes three or four regular sized burgers from the menu and stacks them up into one tall burger, you just need to use your best judgement. The middle buns will most likely be really soft, greasy, and covered with sauces and toppings, so you should eat those early on because they will taste bad later on in the challenge. Just take the top bun off and break the burger down layer by layer. Eat the middle buns along with the layers. Whether you eat the middle buns with the burger patties, or eat them completely separately, that really makes no difference, so the choice is up to you. 6. Dunking is completely up to you, if you are allowed to dunk – I try to never do this unless I have to, but you may choose to dunk the buns in water or some other liquid so that you can chew and swallow the bread much faster and easier. Some restaurant rules allow you to dunk and some do not. If you know that you will be dunking the buns before even beginning, you may want to confirm that you are allowed to do that. You don’t want to get disqualified for breaking the rules, and not knowing a particular rule is usually not an acceptable excuse, especially if the “no dunking” rule is posted somewhere. If you do choose to dunk, please be as mannerly and clean as possible. Nobody will want to watch you eat if there is gross food debris and liquid all over your table. 7. Make everything easier on your mind towards the end of the challenge – To win food challenges, you must be mentally strong and determined. You have to be able to push past the point of discomfort and finish the rest of the food on your plate. There are ways to make it easier on your mind though, so make sure to do that towards the end of a really tough challenge. There are certain things you can do to trick your mind into thinking you only have a few bites left, and that you can finish them. If there are multiple sides and plates involved with the challenge, stack them or get rid of them off the table as you continue to finish things. If you are really full and there are only a few bite of fries left, separate the fries into little bite-sized piles. If you have 10 small piles, then you know you are 10 bites away from being done. That isn’t too hard is it? Then you can just keep taking bites until everything is gone. Try this method, and you will become very relieved once you get down to just a few tiny bites left. You mind is your biggest enemy, and that is why you need to train, strategize, and become confident that you will dominate before the challenge even begins. Listen to music and play little head games to trick your mind and body into pushing forward to achieve victory. Think before starting and not while eating!! 8. Kneel or stand if necessary so that your stomach can expand further – Towards the end of a food challenge, you may feel the need to stand up and let your food settle a little before you begin eating again. For most challenges, you are allowed to get up, stretch, and walk around your table. You just can’t leave the room or go to the bathroom. When completely at rest, your stomach is about the size of your closed fist. Towards the end of a food challenge, it is obviously a lot bigger because it had to expand to fit all of the food you have eaten. Your stomach and organs have a lot more room to move around when you are kneeling or standing than when you are sitting, for obvious reasons. That is why many competitive eaters stand during longer eating contests, so they can move around and get their bodies moving so that their stomach can expand more easily. If you watch any of my videos, you will see that I kneel during almost all challenges unless I have to sit in a booth. Kneeling down achieves the same results as standing, but it is a lot more relaxing for me. You may choose to sit, kneel, or stand during your challenge, depending on your personal preference. The end goal of your food challenge is to win. What you do to get from point A to point B is up to you. Using this tip and the tips above, you will be able to get to point B a lot quicker and easier, and you will proudly win your next multi patty stacked burger challenge. If you combine the tips above with the Basic Strategy Tips For Winning A Food Challenge, you have all the major advice that you need to plan the strategy you will use to dominate your next stacked burger eating challenge.